As DFS namespaces scale in size, managing DR in an efficient manner is a matter of interest. One idea - if you’ve got a large namespace - is to use Active/Active DFS, or two paths, one to the primary site (with read-write data), one to the secondary site (with read-only data), both targets enabled, but the DR path is effectively down so it should just use the active primary one! REM Repeat the above as many times as required! Drive Z: is now connected to \\lab.priv\NASTEST\TEST2. Notice the first time we connect it took over 20 seconds! The next time 0.01 of a second! And remember, this is for every DFS Folder/Link, if the link hasn’t been already cached (and you’re referred to the wrong one). Even though once you’re connected it is no problem, this delay can impact login times, and if the drive gets disconnected, the wait for re-connect will contribute to a poor end-user experience, which is unacceptable! What options are there in DFS Management around this? 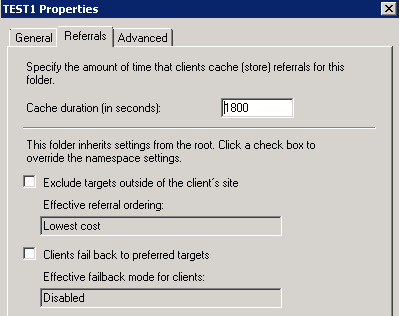 Note: The DFS Server in the images and examples above is a Windows Server 2008R2 DFS box! How to Fix the Problem - Part 1? 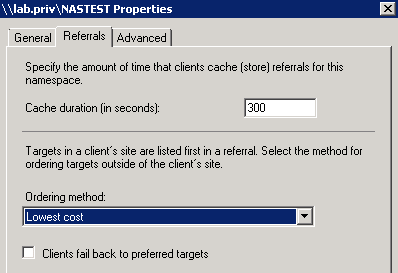 After going to the effort of creating subnets and sites in Active Directory Sites and Services; setting the site link costs to favour primary (most things are in the default site); and configuring referral ordering; the behaviour was more predictable. Still there was a ~20 second timeout when connecting to a link after failover (but not every link.) The behaviour when primary was up, never had delay. And, when the DFS targets were cached (for 1800 seconds) and even beyond that time, once connected (either in failover or not), the behaviour was consistently quick to connect. Still, why the 20 second timeout, can we not reduce/fix it? How to Fix the Problem - Part 2? 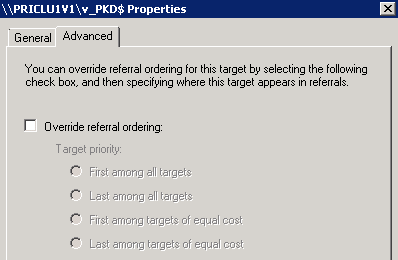 See: installing DFSUTIL on Windows Server 2008, 2008R2 and Windows 7. 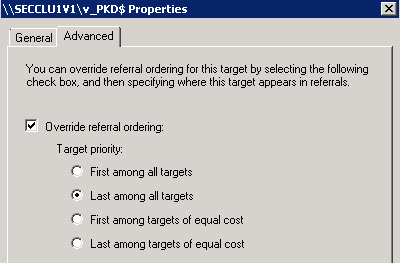 PS Another idea - if active/active DFS is desired, but we want the secondary referred first in a failover, update the site cost to make it more attractive (and referred first)?